I remember once arriving at an event where someone shook my hand and said “Warm welcome.” I thought, I’ll be the judge of that and replied “Insincere handshake.” I feel the title of this recipe is a bit like this – let the taster decide if it’s decadent or not. Having said that, it is very tasty. The meaty base is a classic shepherd’s pie with added extras: balsamic vinegar, Worcestershire sauce and red wine, which add a rich sweetness to it. The mash contains nutmeg and breadcrumbs for crispiness. Lorraine “likes to” pipe the mash on top. I thought, that’s sad, then I thought, well I’ve never tried it, so I had a go. Moral of the tale is, warm and wet mashed potato in a makeshift greaseproof paper piping bag is a failure. 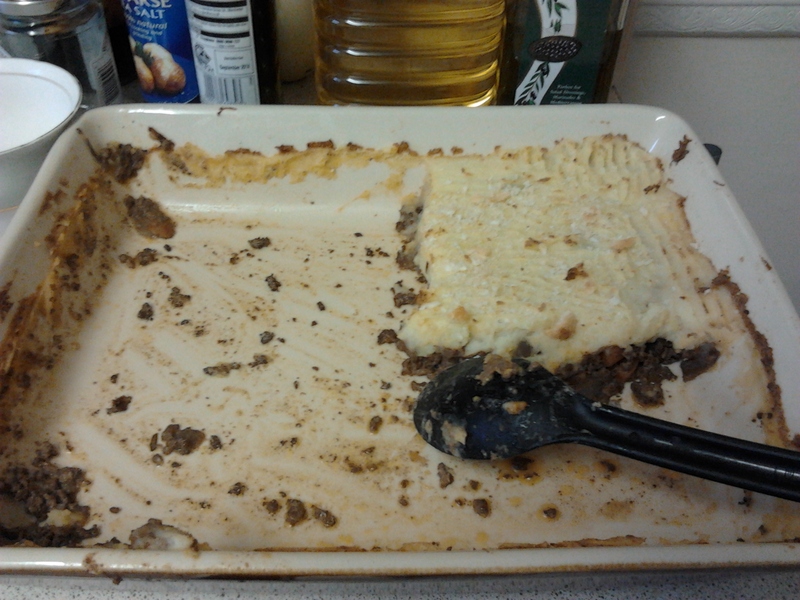 I had to scrape it out and fork it on top instead, which still looked nice. It tasted very good, almost … decadent I would say. It got eaten rather quickly; so quickly in fact that I could only take a picture of some remains. I made it for Sunday lunch and it worked well. I did the meat in advance the night before, so I just had to finish off with the potatoes on Sunday (Don’t do the potatoes in advance because the starch in them changes and becomes indigestible). I would normally serve shepherd’s pie with vegetables, but Lorraine suggested salad. This helped to make it stress-free for Sunday lunch.